This song featured on the blog just over six weeks ago. A stunning and unexpected wall of sound that took the band to a whole new level in terms of fanbase and out of the realms of mere indie-pop. David Gedge doesn’t write 3 minute pop or rock songs; instead we often get mini soap-operas set to magical tunes. This is a real tear-jerker. Listen to it drunk and think about someone who once broke your heart. I dare you not to think of them and then say you weren’t fighting back the tears, whether of anger or sadness. The production of Steve Albini on Seamonsters really helped the band break out of the indie-shell and a hint of what he would do can be found on the remix of the opening track from the Bizarro LP. Thirty seconds are trimmed from the original while the arrangement is tightened and beefed up. I love how the electric guitar gives way to the acoustic strumming about two-thirds of the way through before the ‘beached whale wailing’ beckons David back to microphone. First recorded back in 1987, this evergreen single is probably the band’s most played live song. It never fails to get a huge roar when the opening notes are struck and it takes all the males in the audience back to a time when they were slimmer, fitter, healthier and had much more hair on the top of their heads and none up their noses or in their ears. At which point we all kid on we are 30 years younger than we really are and four minutes later collapse in a heap wondering why we can’t dance as energetically as we once did. “A stranger’s hand on my favorite dress” – one of thousands of killer lines he’s written over the decades. 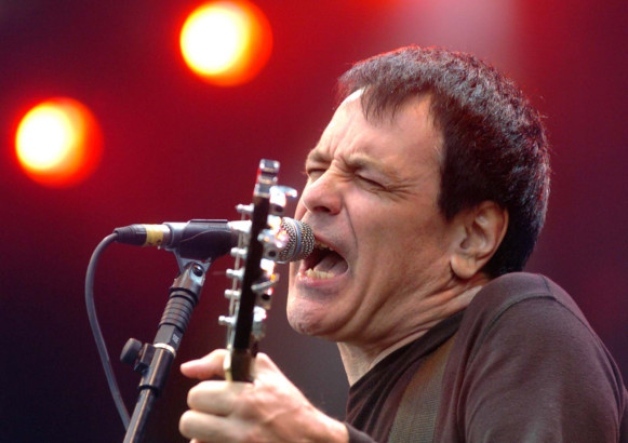 Between 1998 and 2004, all of the material written and recorded by David Gedge came out under the moniker of Cinerama – and extremely high quality songs they were too. The first time anyone ever heard this track was as part of the last ever Cinerama Peel Session. Within a year, the Weddoes were back with their first LP in nine years with this being one of many highlights. A lighter, poppier side to the band with a tale that is Morrissey/Smiths-esque in genre and quality. There’s some wording on the back of the sleeve of this single. This is an immense piece of music that still sounds incredibly fresh more than a quarter of a century on. There is nothing more that needs to be said. Ever since the band reformed, just about every time they perform Kennedy in a live setting it is followed up with one of the slower songs from the repertoire to enable the audience to recapture its collective breath after the bouncing around. And so with this imaginary LP. A song of two halfs. The first two and three-quarter minutes is a straight-forward but beautiful love song with a dreamy backing vocal from Terry de Castro that is a throwback to the Amelia Fletcher material. The final two and a bit minutes is pure Cinerama…..strings, horns and guitars collide magnificently in a coda that Tindersticks would have been proud of. A hidden gem of a track. A shortened version of another of the outstanding songs on Seamonsters. This aural assault on the ears ends in a blast of controlled feedback for about 40 seconds…..live it always sounds magnificent. An often overlooked classic from the singles period. Cracking tune and for once it’s not a mini soap opera – instead it celebrates the joy of falling head over heels. The tune, with its extended guitar riff to the end of the song, in many ways is reminiscent of Kennedy which is no bad thing in my book. Some thought it a folly for the band to put out a limited edition vinyl 45 once a month throughout 1992 with the single being officially deleted the day after its release. The plan however, worked a treat with every one of them going into the charts for one week only with the highest placed being #10 and the lowest #26 – the singles actually sold in the exact same quantities, the placing they got depended on how the sales of other singles that particular week had gone. The singles and the cover versions that made up the b-sides were later compiled onto two separate CD albums entitled Hit Parade 1 and Hit Parade 2. The initial copies of the second of these came with a bonus disc containing exclusive BBC Radio versions of the twelve singles – some had gone out on BBC Radio Leeds, some on the Mark Goodier Show on Radio 1, some on the World Service (I’m not kidding!!!) and some made up one of the many sessions the band recorded for the John Peel show. A song that had first been aired two years previously on the Peel show when it was known as What Becomes Of The Broken Hearted? I’ve admitted before that I was late to The Wedding Present. I hadn’t given them much attention in the early days simply as the music papers were saying this was the band to fill the Smith-sized void in your life and I just didn’t think at the time that anyone could do such a thing. George Best had been out for the best part of three years when I first got a hold of a copy. This was the initial stand out track for me. And I still love it all this time later. So there you have my take on ten tracks for a compilation LP. It’s taken me nearly four weeks to deliberate over and determine. I’m sure some of you will take me to task…..and quite rightly!!!! The originals came from Altered Images, Steve Harley & Cockney Rebel, Take That, The Close Lobsters, The Monkees, Isaac Hayes, The Go-Gos, The Go-Betweens, Orange Juice and Pavement. Oh and the comment about Felicity being a William Shatner number is not a reference to a track on George Best……it’s a play on words as the song, despite originally being an Edwyn Collins vocal, was in fact composed by James Kirk………. I was never a big WP fan but I did love some of their Peel sessions, and they have grown on me with age. I still have an old c90 tape from the Peel session with Happy Birthday on it, so very pleased it made track 1 on your bonus disc. I would buy this album – just because the bonus disc;-) I like them since the days of George Best. Maybe one of the best record cover ever. A very difficult prospect JC. I agree with most of your choices although, from Take Fountain I would have to have picked Ringway To Seatac, although chosing anything from this album is difficult as it is possibly my favourite. It would not, however have suited your purpose. As for the covers, they are one of many, many things that make Gedge et al so great. I love their take on Box Elder. I might have thrown in their version of Getting Better too. i’m not sure if you went to any of the george best anniversary shows but they were a real exercise in stamina for the audience…! Interstate 5 was the last song to be eliminated from the shortlist. It was going to be the opening track of Side 2 but its inclusion would have seen Flying Saucer removed and I really felt that at least one of the 12 singles had to be included…. Listening to all the albums again in detail and I now can no longer separate Seamonsters and Take Fountain as being my favourite with Bizarro making up the Top 3. It would have been easy enough to have put together a ‘Best Of’ from those three LPs alone. Just a reminder that I’m open to contributions from all and sundry and right now I don’t have any efforts in the pipeline. I know I’m in a very small minority, but Watusi is my favourite WP album (it was great to see them perform it in Edinburgh last year, even if they didn’t do it in the correct track order). I’d let you have eleven tracks so you could fit something from Watusi on this cracking compilation. Also, from the same era, I love their version of Jumper Clown, which should be included on the covers LP. It takes a bit of a swipe at Mark E Smith and makes me laugh every time I hear it. Paul……Swimming Pools, Movie Stars instead of Always The Quiet One was another thing I mulled over in terms of being a great fit at that point in the imaginary LP. Four weeks of listening, narrowing things down and then agonising over the final choice…..this is why the posts in this series take so long to appear from one to the next!!! Did anyone else get ” Hit Parade 3 ” in a pink sleeve, I was wondering around Paris and saw a copy, couldn’t belive my eyes, didn’t know it even existed ? Gordon….according to Discogs it was a French-only release and was meant to consist of a few cover versions except that a mix-up at the pressing plant led to Brassneck initially being included at the expense of Box Elder. Saw these 3 times back in 1987, so clearly my selection would be biased more towards their early output, although I really like Take Fountain. I’d definitely have the acoustic Give My Love To Kevin (as mentioned by Jim) just because it’s a little bit different to everything else.